Learn about everything from the onstage antennas to the band's guitar pick arrangement. The pair paid tribute to David Gilmour on his birthday. 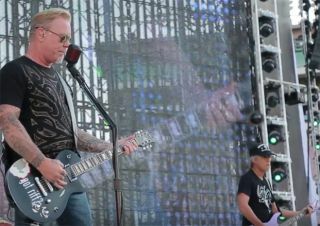 Metallica's lead axeman jams with one of his idols. The band’s 12-song unplugged set benefited their All Within My Hands charity. Metallica Share Instrumental Demo Version of "The Shortest Straw"
Metallica pay tribute to the Purple One in his home state. '...And Justice for All' 30th Anniversary: Kirk Hammett Discusses Recording Metallica's "One"
The Metallica guitarist on writing the song's iconic solos, and the gear he used in the studio. Hear Michael Schenker and Metallica's Kirk Hammett Team Up for New Song, "Heart and Soul"
The Secrets Behind James Hetfield's Guitar Sound on Metallica's "Sad But True"
Watch Metallica Salute Manchester with Cover of "Don't Look Back in Anger"